Hello! This is my second card for this week's Tuesday Throwdown challenge. Please scroll to the next post for the first card. This week's theme is "Distressing" and our sponsor is Power Poppy. 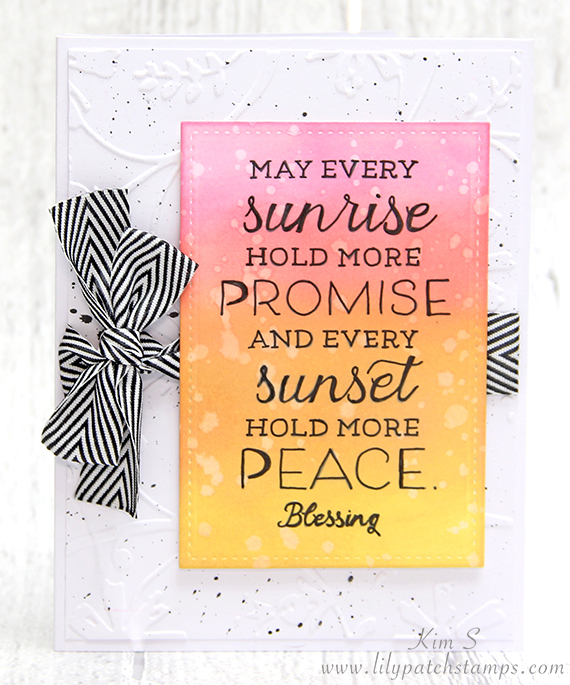 This beautiful sentiment is from the Sunset Sway set. I used distressed oxide inks to create the background. It dulled the sentiment so I ended up going over it with a fine micro pen. I embossed the white cardstock then distressed it with black splatters all over. Please join Team B over at the TT blog for more DT inspirations and enter to win a fun prize from Power Poppy. So lovely. I like your background - some subtle details but not too much to take away from your beautiful focal panel. Thanks for joining us at STAMPlorations CAS. Beautiful backgrounds,thank you for joining us at Digi Choosday this week.